Though there are more than 100 colleges and universities in Massachusetts — that’s a whole lot of students! — Massachusetts is not too friendly to those on a budget. In fact, the cost of living in The Bay State averages 30% higher than the rest of the country. Fortunately, college towns vary dramatically when it comes to the cost of living. To figure out which college towns are most affordable, we looked at costs for housing, groceries, health, transportation, and utilities, and compared them to the national average. We also considered features like amenities, crime rates, public transportation, and overall quality of life before narrowing our list down to the 20 most affordable college towns in Massachusetts. All data was taken from Wikipedia and Sterling’s Best Places. North Adams, home of the Massachusetts College of Liberal Arts, is a charming college town situated in the Berkshire mountains. It’s also one of the more affordable towns in The Bay State — good news for college students on a budget. With a cost of living below that of both the national and state averages, students living in North Adams can afford to enjoy some of the town’s local charm and attractions. The Berkshires boasts dozens of hiking and running trails, not to mention the myriad parks and outdoor activities within North Adams’s borders. The quaint downtown area is perfect for strolling, while The Massachusetts Museum of Contemporary Art is one of the larges centers for contemporary visual and performing arts in the country. Situated beside the bay in the southernmost part of the state is Dartmouth, home to two notable colleges and the lowest cost of living of any college town in Massachusetts. The 352-year old town is quiet and tranquil. A lively fishing and boating industry still thrives here, while the several working vineyards in the area are all part of the Coastal Wine Tour. Despite the local agricultural industries, food prices are slightly higher than the national average, as are costs for utilities, transportation, and healthcare. Housing, however, is a totally different story, with average rental and sale prices coming in at only half of the national average. Springfield is right on par with the national average cost of living, a rarity in the expensive state of Massachusetts. While students should expect to spend a little more on things like food, health, and utilities, there is the potential to save a bundle on housing. Indeed, housing costs in Springfield average a whopping 30% less than the national average! People looking to stick around awhile will be glad to know that the local economy is one of the most stable in New England, due in part to the presence of such large and historic companies as MassMutual Financial Group, Smith & Wesson gun manufacturer, Merriam Webster Inc., Big Y Supermarkets, and the American Hockey League. As one may expect of a college town located in a region that has been referred to as “Happy Valley,” those living in the small town of Amherst are happy indeed — at least when it comes to the cost of living. Perhaps because Amherst is home to three prestigious schools (and therefore a large student population), housing in Amherst costs significantly less than the national average, though the costs of healthcare, utilities, and groceries are slightly higher. A center for liberal politics in academia, Amherst is a popular choice of address for a number of artists and writers who enjoy the town’s active college scene and classical New England vibe. Located near the desirable Berkshires, Westfield is home to Westfield State University. The town has a unique history (it once led the nation in the production of buggy whips) and a modern day reputation as a safe community with one of the best emergency response teams in the country. Though Westfield’s cost of living averages only 15% higher than the national average, students should expect to spend a little more on everything from groceries to monthly utilities. Housing comes in at about 20% higher than average, while the lack of public transportation makes a car very necessary to life in Westfield. With more than 10 colleges and universities calling it home, Worcester is a great place for those on a college budget. Food and utility costs average below even the national average, while housing and transportation average only about 4% and 6% above the national average, respectively. In fact, an apartment here will run you about $1,208 per month. Such numbers make Worcester a desirable choice of address within the expensive Bay State. Concerts and theater performances all stop in Worcester, while the Worcester Art Museum and the local hockey team also provide for fun (and cost-friendly) pastimes. Northampton has a cost of living that is 9% lower than the state average. Food and transportation costs are estimated to be even lower than that, thanks in part to the variety of surrounding farmlands and the UMASS transit service, which provides cheap and quick transportation between surrounding communities and schools. And the best activities here are practically free! Northampton enjoys a well-deserved reputation as a great place for lovers of the outdoors. Hiking, swimming, biking, and river paddling are all popular pastimes in this beautiful area. As home to UMASS Lowell, the second largest state university in Massachusetts, and upwards of 27,000 students, Lowell is enjoying a new reputation as a rapidly emerging college town. Lowell is the fourth largest city in the state, and the second largest in the Boston metropolitan area, so students living here have access to some of the greatest restaurants, shopping, and entertainment the country has to offer. And with a cost of living below that of the state average, students in Lowell may actually be able to afford such fun. Housing costs average about 18% above the national average, while transportation costs are even lower at 10% above the national average. Great Barrington is a vibrant small town in southern Massachusetts, a popular choice of location for second homes, and a college town of a different kind. The town’s local college, Bard College at Simon’s Rock, is a liberal arts college designed specifically for students of high school age. More than 70 restaurants exist here, making the average cost of food only slightly higher than the national average. The same can be said for the costs of utilities, transportation, and estimated miscellaneous costs, all of which are on par with or only slightly above the national average. Only housing costs come in at a whopping 67% above the usual. But you get what you pay for. Theater, music, and cultural events are practically constant here, while many New Englanders use Great Barrington as a base for skiing at the local Ski Butternut resort. Indeed, Great Barrington is so charming that Smithsonian magazine named it the #1 “Best Small Town in America. Williamstown is home to Williams College, one of the top-ranked liberal arts schools in the nation. This small town, located in the beautiful Berkshire mountains, is the perfect choice of address for those who love spending time outdoors, as hiking and running trails are plentiful. For those who prefer to spend time indoors, the Williams College Museum of Art houses an impressive collection of artwork from around the world. Though students living in Williamstown should expect to spend approximately 84% more than the national average, other costs such as food, utilities, and transportation are all on par with the norm and help to make Williamstown an ideal and affordable college town. Situated nearly halfway between Boston and Providence, Rhode Island, Bridgewater is the small town that is home to Bridgewater State University, a public liberal arts school that got its start as a highly regarded teachers’ college. Of the nearly 27,000 Bridgewater residents, almost 12,000 of those are students. Thus, it’s hardly surprising that Bridgewater residents enjoy a certain fun college town vibe within their small community. Bridgewater ranks 33% above the national average in terms of living costs, though housing is only about 50% higher than other places in the country — a good deal for New England and, especially, Massachusetts. America’s spookiest town is also a great college town! Home to the 10,000 students at Salem State University, a school that is particularly well regarded for its nursing program, Salem is a fun town that thrives on its cringe-worthy history and modern-day tourism. Historical reenactments, walking tours, and museums are all popular activities here, as are the attractions surrounding the waterfront town’s rich maritime history. While housing tends to be more than 50% higher than the national average, food and transportation costs are generally much more reasonable. And to really make ends meet, one could always get a job in that Salem Witch Trials historical reenactment. Named by CNN Money magazine as one of the “Best Places to Live in the US,” Framingham is a tight-knit and charming community chock-full of athletic facilities, civic centers, public parks, and other recreational areas. But with high-class amenities come higher prices. Framingham’s cost of living averages 15% higher than the Massachusetts average, with housing costs being the most expensive of those things deemed necessary. Still, for those who value an active community and easy access to Boston, Framingham remains an affordable option. Medford, most notably the home of Tufts University, is both a college town and a family-oriented community — the best of both worlds. Recreational areas and community-wide events are both common here, while the Medford Police Department has received national recognition for its safety-focused smartphone apps. Though the Medford cost of living averages 25% higher than the Massachusetts average, Medford is considered one of the most affordable towns in its region, with neighbors Cambridge, Somerville, Winchester, and Arlington costing much, much more. A diverse range of restaurants makes it easy to find competitive prices, while good public transportation options (including a commuter rail stop) make it a breeze to save on transportation costs. Home to Brandeis University and Bentley University, Waltham is a charming college town with a distinct New England feel. The cost of living is quite above both the national and state averages, with housing just under 150% above the national norm. The good news: a minuscule unemployment rate, low taxes, practically zero crime, and a laid-back college town vibe. The Charles Riverwalk Park along the Charles River is the perfect place to spend a pleasant afternoon or evening, and fishing, jogging, and riverside meals are all enjoyable activities here. Just be sure to bundle up. Located just west of Boston, Waltham experiences the usual New England winter and summer averages of about 68 degrees Fahrenheit. Besides being home to Curry College, tiny Milton has a lot to be proud of. The affluent Boston suburb is the birthplace of President H.W. Bush and architect Buckminster Fuller. It has more citizens of Irish heritage than any other city in the U.S. It also has the most conserved land of any Boston suburb, and Money Magazine has consistently ranked it as one of the “Best Places to Live” in the entire country. Students in Milton find themselves in a laid-back and bucolic setting perfect for the college experience. While housing costs are nearly 200% higher than the national average, college-friendly places do exist within the Milton borders. 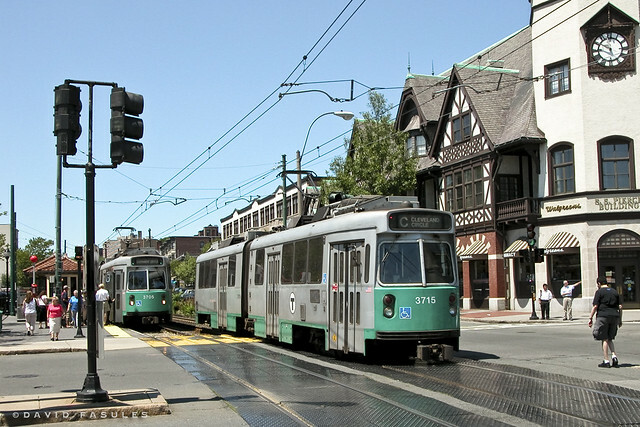 A trolley service makes travel around town and to Boston a breeze and cuts down on transportation costs, as does the quick access Milton residents have to major highways and interstates. An address in Cambridge may cost students in outrageous housing costs, but the city also offers an incredible quality of life surrounding its thirteen colleges and universities. While housing costs can reach up to 300% above the national average, transportation is easily accessible and student-friendly food options are plentiful, especially around popular Harvard Square. Despite these higher costs, Cambridge boasts one of the highest average household incomes in the state, partly due to the presence of some major companies, all of whom actively recruit from the surrounding colleges. Google, Novartis, Pfizer, IBM Research, Microsoft Research, Staples, Hewlett-Packard, and Amazon all have locations or headquarters in Cambridge. Brookline, one of Boston’s most desirable suburbs, is home to six schools, including Newbury College, Hellenic College, and the New England Institute of Art. The town is located a stone’s throw from Boston, but holds its own when it comes to big-city amenities. Upscale shops, restaurants, recreational parks, and various apartment buildings (some more affordable than others) are all in Brookline, as are quality healthcare options, affordable grocery stores and markets, and a stop on Boston’s efficient and affordable commuter trolley line. Despite being only seven miles from downtown Boston, Newton is a desirable choice of address thanks to its small town vibe, fascinating history, and cultural diversity. It’s even known as the “Garden City” because of its lush green surroundings. 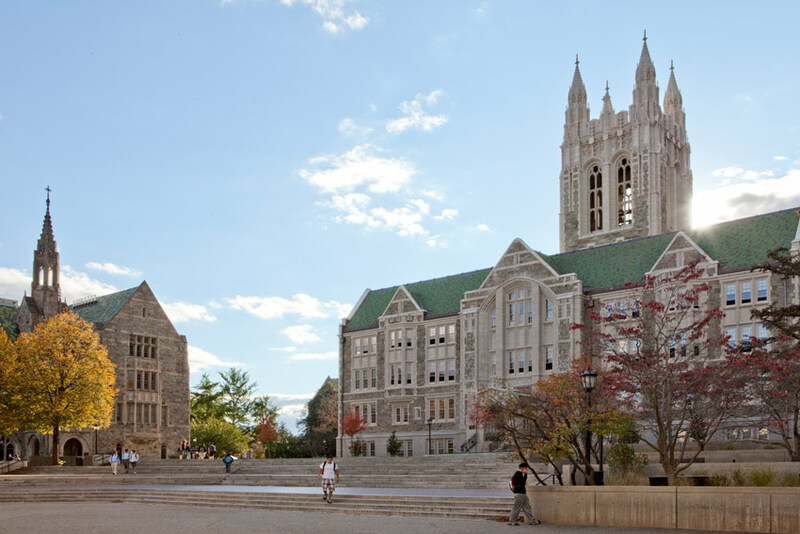 Students attending Boston College or any of Newton’s 10 other institutions can take full advantage of all of the sophistication and comforts that come with being both urban and suburban, most notably: historic homes and housing, quality healthcare, a piece of the Boston Marathon, easy access to entertainment, and one of the largest libraries in Massachusetts. Unfortunately, such a wonderful quality of life also comes with a higher cost of living. While student-friendly options do exist, Newton generally costs a whopping 128% more than the national average, with housing being the most expensive. One of the most famous college towns and most desirable addresses in Massachusetts is also the most expensive. Wellesley, the home of women’s liberal arts college Wellesley College, is a charming and historic community complete with: two lakes; myriad running and cross-country skiing trails; various parks, playgrounds, and picnic areas; and even well-maintained community tennis courts. Downtown, the historic district feels like a quaint village with small shops, boutiques, and restaurants. Unfortunately, all of this comes with quite the price tag. The cost of living in Wellesley is nearly 200% higher than the national average, with housing costs being the largest jump. Luckily for students, both local colleges have dorms ranked among some of the best in higher education. The good news: food, health, utilities, and transportation costs all hover around the national norm.